Booklist Online – Top 10 Religion Books for Youth: 2008. For most Jewish Americans, the story begins with immigration-their own, their parents, or grandparents. 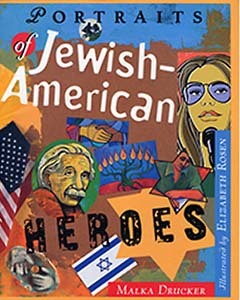 Despite their varying connections to Judaism and the Jewish people, those about whom I wrote were proud to be Jews. Most came from poor families, experienced subtle and not so subtle anti-semitism, and women bore the extra burden of gender prejudice. Despite these challenges, they were heroes who not only honored themselves in their achievements, they were people in whom we take special pride as being part of the eternal family of Israel.